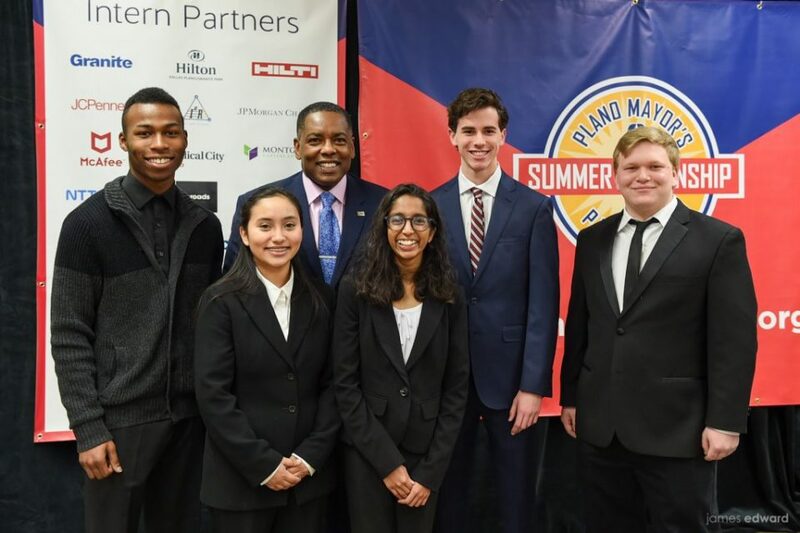 Plano ISD and public school sophomores and juniors who reside in the City of Plano and who are interested in a chance to work at a top North Texas company this summer have an opportunity to apply for Plano Mayor Harry LaRosiliere’s Summer Internship Program. Students with at least a 3.0 GPA can apply now through March 1 (by 5 p.m.) for the Plano Mayor’s Summer Internship Program. An amazing “learn-and-earn” opportunity, the coveted program teaches essential workforce skills and provides connections to some of the area’s top corporations and nonprofits. The eight-week paid internship program runs June 10-Aug. 2, and students earn a minimum of $10 per hour working 20-to-40 hour weeks. Marking the sixth year of the program, Mayor LaRosiliere reports that students benefit from real-life experiences in the workplace, meaningful assignments and opportunities to shadow executives. Interns get to observe company operations, network with upper-level management, and gain exposure to a wide array of careers. Participating companies from past years include Baylor Scott & White Medical Center – Plano, JCPenney, JPMorgan Chase, PepsiCo/Frito-Lay, Toyota Motors of North America, Capital One, NTT DATA Services, Ericsson, Hilti, Inc., and McAfee. Nonprofits included the Boys & Girls Club of Collin County, Children’s Health and My Possibilities. To qualify, students must complete an online application, which includes a short essay. Additionally, applicants must be enrolled as sophomores or juniors (seniors are not eligible) at a Plano ISD high school or be sophomore or junior public school students who reside in the City of Plano; have a 3.0 GPA (minimum); be 16 years of age by June 10, 2019; and be eligible to work in the United States. Once those requirements are met, employers will interview intern candidates at the highly competitive Job Fair slated for Friday, April 26, from 3-7 p.m. at the Plano Event Center. Selected students will receive a formal job offer in May. If chosen, students will then complete two days of Intern Enrichment and Orientation on Wednesday, June 5, and Thursday, June 6, when business soft skills, networking, teambuilding and work-readiness topics will be addressed. New this year is a Community Service Day to be held June 14 at North Texas Food Bank, when interns come together and give back in a meaningful way. Details and the online application are available at planomayorsinterns.org. For questions, contact Mary Peltier at mary.peltier@vwaitgroup.com.